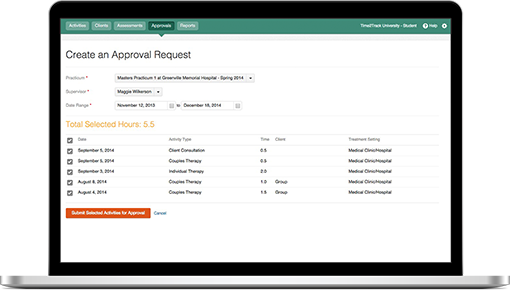 Time2Track is easy to use, provides clear reports, and is very affordable. I had been logging my hours on paper and always worried about losing my logs somehow. I wish I had signed up sooner! Kelly L.
Time2Track’s MyInternshipJournal is the easiest way for university teacher education departments and student teachers to track classroom and fieldwork hours. * Choose “Student Teaching” as your Organization during signup. Are you a program director, training director, faculty member, or administrator? Now you can track and verify student teachers’ hours and collect forms and evaluations online — no paper required! can save your program valuable time. MyInternshipJournal has already created a configuration of the software which complies with the requirements of the California Commission on Teacher Credentialing (CTC). We can easily modify the software to meet any of the unique requirements of your state and program. Contact us with your questions or schedule a demo to learn more and to discuss your program’s needs. Let us worry about your program’s fieldwork, classroom, co-teaching and supervision hours. Start preparing for obtaining your teaching credential today. Start using Time2Track at the beginning of your student teaching, and your fieldwork and supervision hours will be ready to go when it’s time to apply for your teaching credential. Don’t lose sleep stressing about your progress toward hour goals for your Teacher Accreditation. With a few clicks, you can see your total classroom and co-teaching hours and a variety of reports, charts, and graphs that show your progress at a glance. Secure your total student teaching program hours. Your computer could crash. Your smartphone could get destroyed. You could lose your notebook. When it comes to your student teaching hours, don’t take any chances. Store them in Time2Track’s MyInternshipJournal and rest easy knowing your hard earned hours are safe and secure. 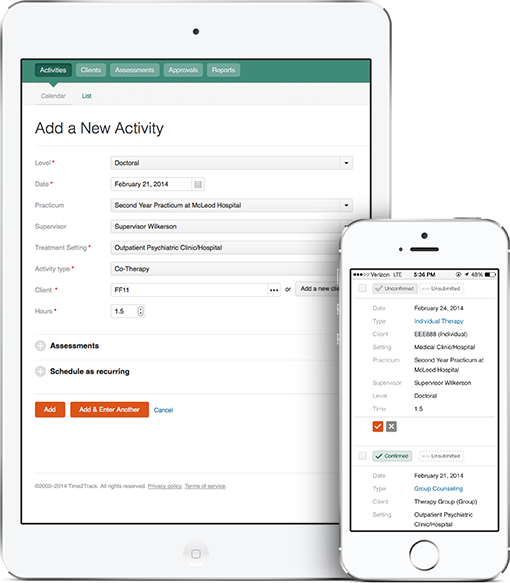 Time2Track’s MyInternshipJournal is mobile-friendly, so you can log your student teaching and credentialing activities from anywhere, anytime. Progress reports can easily be printed, complete with signature lines for your supervisor. Get the signatures you need quickly and easily.